Blowing in from California, the new musical Paradise just arrived in Austin. 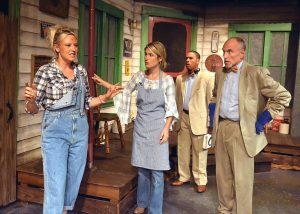 Like the real firestorm that destroyed the town of Paradise in late 2018, the musical shows how the people of a very small Southern rural community can come face to face with their demise. Only in this case the fire and brimstone comes not from Nature but from a preacher who has come to town to save them from their own fate. Little do they know that when they sign a contract for a reality TV show about their town, orchestrated by Reverend John Mountain, they are signing away their souls. Their fate was indeed cast before the preacher arrived in Paradise, just in time to witness the town church being burnt to the ground. His mysterious plan to build a megachurch at the opening to the town’s abandoned coal mine is the deep secret embedded in this raucously amusing production. For all the fun and laughter in this musical, which is very genuine, its exploration of how a populace can be duped by the lies of a commanding presence is very relevant to what is happening today in a certain Oval Office. When the mayor of the town, Mr. Gayheart, muses out loud that his role in a reality TV show might be a stepping stone to the Presidency of the United States, one does not have to perform a psychological study of the play to understand the subtext. But it’s not the mayor, played with fey flare by Chip Bolcik, who is the enemy of the people. For this we need look no further than Rev. Mountain, played with charismatic brilliance by Jon Root. Combining good looks with a memorable voice (he is also a voiceover artist, having appeared in more than 200 commercials), Root incorporates Elvis poses and messianic body language in a mesmerizing performance. One can scarcely imagine another actor in this role, and indeed the entire ensemble (all hailing from the original production in California) are clearly the product of meticulous casting. If you could ever imagine a hillbilly version of the 1957 Broadway musical The Music Man, this is it, with the Reverend here as the conman Professor in the The Music Man, made into a 1962 movie starring Robert Preston. As another hillbilly element, think of Jeb in the Beverly Hillbillies. The actor Buddy Ebsen who played Jeb was a song and dance man, so it’s not a stretch to imagine him singing his way through an episode of that 60s TV show. In Paradise, we have Ezra, played by Dave Florek who delivers his spoken lines like Jeb and his musical lines as we might imagine Ebsen would do in a similar breakout role. Backed by a hillbilly-style bluegrass quartet (who regales the audience before and during the play) Florek and the others get to ride a wave of musical comedy that sweeps over the audience as well. Austin Playhouse artistic director Don Toner told me he saw this play twice in California, and arranged to bring it to Austin in collaboration with Frost Entertainment. The stage here is larger than the small venue it originally appeared in, and the LA stage designer came here to envision the larger set for Austin Playhouse. Toner described the musical as “a satirical look at modern evangelism,” and this is certainly true as we see the preacher consort with Chastity Jones (played by Nina Brissey), a woman he “rescued from a strippers’ pole.” Rounding out the cast are Kelsey Joyce as the lovable virgin, Randy Taylor as the black son of the white mayor (therein hangs a tale), Paige Segal as a no-nonsense hillbilly blonde, and Jamie Daniels as the good-natured reality TV show producer. 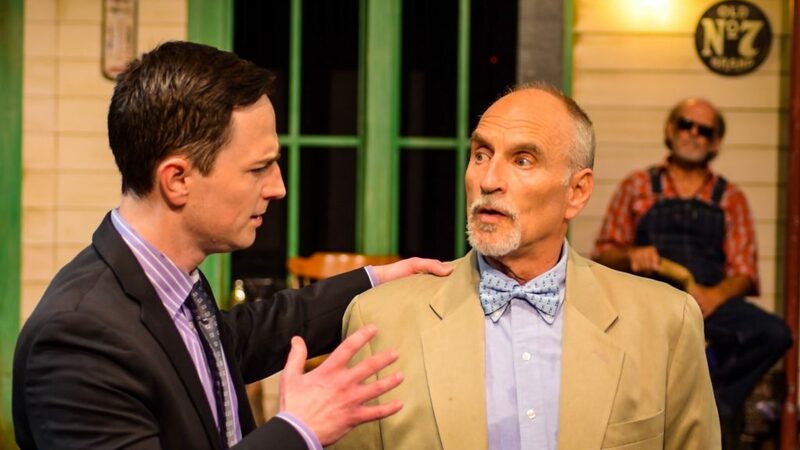 You won’t likely see a finer musical in Austin this year, so see Paradise before it ends here on Feb. 3, 2019.
your eloquent insight, as well as gaining access to a new, relevant website. My husband and I will look forward to reading future recommendations for live performances and culture in the Austin area. That was one of the most eloquent reviews we have ever had. As the Producers of Paradise we are humbly grateful! Thank you and hope you get to come back to our town!